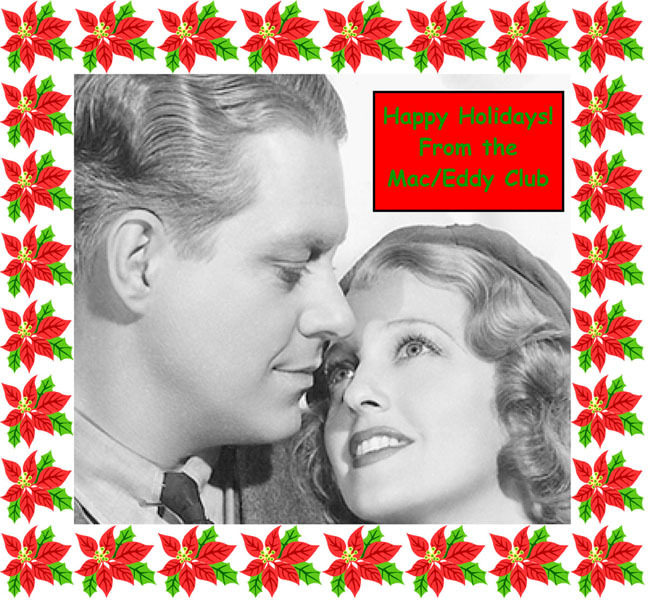 Happy Holidays to Jeanette MacDonald & Nelson Eddy fans from the Mac/Eddy Club! Listen to Nelson singing Christmas carols here. Jeanette MacDonald Nelson Eddy website nearing 3 million hits! Jeanette MacDonald and Nelson Eddy continue to be popular on the ‘net. Amazing but true – maceddy.com is fast approaching 3 million hits on the website! And – I’m not talking about 3 million hits since the website first went up in 1996. I’m talking about since our new, high-tech website went live in October 2006 – exactly two years ago this month! The software program that runs the site has a built-in counter; I insisted the web designer put a link to it on our home page. It’s on the far left of the page, just below the “Babelfish” translation tool. If you are the lucky person who clicks onto maceddy.com and sees the number 3,000,000 – you will receive a gift credit of $100 towards ANYTHING on our website! 1. Each time you visit http://www.maceddy.com over the next few days, scroll down the page to see whether you are visitor #3 million. If you are, make sure you have scrolled down enough so that the number is clearly visible on your monitor. 3. Open up a new Word document. Right-click your mouse on the page and click “paste.” It will paste the screen snapshot into the document. 4. Save the Word document and email it as an attachment to us. 5. If for some reason this didn’t work for you, you can maximize your browser and try taking a snapshot again. Or – if you have WebTV – you can take a picture of it with a digital camera, make a print of it and send it to the club. In this case, also please email us to let us know that you are the 3 millionth visitor! PS: Carnival Cruises did NOT raise the prices on our cabins, so you can still make a reservation. Click on the banner above for the most updated information on the cruise. Also, if you’re interested in going but need a roommate, Hallie can help match you up with someone. Contact her at 212-874-1670 or email her at highctravel@yahoo.com. Starting the New Year with our New Blog! Here’s an interesting item re: Jeanette. [Link:] Thanks to Bern for sending it to us! Marine Pvt. Tyrone Power and Army Pvt. Alan Ladd. If you find any interesting Mac/Eddy news on the web, send us the link so we can share it with everyone!